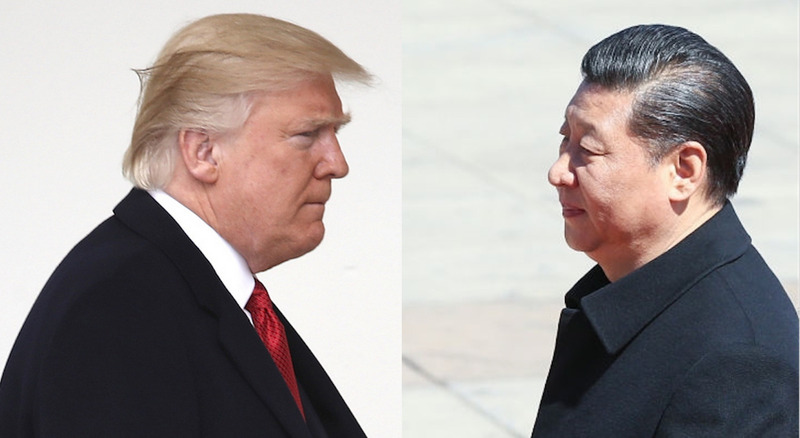 U.S. President Donald Trump (left) and Chinese President Xi Jinping (right). President Trump set low expectations for the trade side of the Mar-a-Lago summit with his tweet that negotiations would be “very difficult.” He is right about that. What the Chinese want from the economic negotiation is very clear–mostly stability and no trade war. They also have a few specific “asks.” They want “market economy status” from the U.S. and Europe, and believe they were promised it unconditionally after 15 years in the WTO. This is an issue of face, as well as having practical import in anti-dumping cases. China also wants the U.S. to lift restrictions on high-tech exports and to provide unfettered access for its state enterprises to come into the U.S. and buy firms. They would like the U.S. to join the Asian Infrastructure Investment Bank (AIIB) and recognize their “belt-and-road” program (specifically, send a cabinet secretary to their May summit). All of these are non-starters politically, except perhaps the cabinet secretary. China has long indicated that it will gradually open these markets, but in fact there has been very little progress for ten years now. The U.S. does not have a lot of leverage to push China to open up. Threatening high tariffs is not likely to encourage China to yield and would backfire by hurting the U.S. economy if actually implemented. History is clear that protectionism does not reduce trade deficits. It leads to a decline not just in imports but also exports. Protectionism makes your partners poorer, appreciates the exchange rate, and invites retaliation—all reasons why your exports will decline. Candidate Trump also threatened to name China a “currency manipulator.” However, for several years now China’s central bank has been intervening to keep the currency high, not low. So, it is in America’s interest to recognize that this is helpful. The first Xi-Trump summit will be a get-to-know-you meeting where each side voices its concerns. The smart move for China would be to commit to open some sectors (perhaps beef, health, and parts of financial services), since openness is in its own interest. However, probably the top leadership is not flexible enough to agree to something like this quickly, especially in the lead-up to the congress. It is more likely that China will agree only to a non-specific commitment to open up over time. A disappointing outcome will fuel the protectionist sentiments waiting in the wings, but China is betting that the administration will be too practical to harm its own economy with harsh measures. The People’s Daily and Xinhua News Agency headlines read: “Xi Jinping Conducts State Visit to Finland and Will Also Visit the U.S. for Presidential Summit.” The itinerary is a calculated lowering of expectations. Donald Trump will go into his meetings with Xi Jinping bearing the baggage of his campaign rhetoric and his “go it alone with North Korea” statements, whereas while Xi would certainly prefer that Sino-American relations remain stable and trade uninterrupted, he could go home and signal that there is no way to deal with the erratic man of Mar-a-Lago and much of the world would nod enthusiastically in agreement. The best we can hope for is the utterance of numerous bromides—and no doubt Xi’s team has planned plenty of possible statements that will make Trump look like he’s bringing jobs back to the America heartland—while the carpetbaggers who make up Trump’s entourage work the angles. The word “historic” is being bandied about in the walk-up to the Xi-Trump meeting, and, yes, any meeting between leaders of the world’s two most important countries is important. Still, let’s not let the theatrical aspect of the thing obscure the underlying reality, which is that there’s not really all that much that Xi or Trump are likely to do to change the basic patterns of the past couple of decades, during which the United States has had to cede a great deal in the face of China’s rise. Following is a sort of balance sheet. China has become a “normal” country, a rational actor that doesn’t want war. The main intellectual justification for “engagement,” that it would induce China to become an open, democratic, and responsible global citizen, has turned out to be mostly (not entirely) incorrect. In other words, China, the global model for the new authoritarianism, is on course to become the dominant power in Asia, and Trump for all his tough talk doesn’t have the means at his disposal to much alter its course. Press reports indicate that Xi, eager for an atmospheric success, will make some concessions on trade and investment, which the Trump administration will no doubt ballyhoo. On Korea, it might be possible that Trump the deal maker would withdraw THAAD from the South in exchange for greater pressure on the North. Possible, but unlikely, and even if the two leaders agree to step up pressure on the North, nothing short of an American invasion (which China would adamantly oppose) is going to stop the North Korean nuke program. Our foreign policy talking heads will likely speculate on how well the two men get along. But what matters really is what might be called the deeper forces—impelled mainly by China’s determination to be a major world power and the skill it has employed in pursuit of that objective—and in that sense it’s a mistake to think it matters whether Xi and Trump like each other or not. Connecting the two largest economies and militaries in the world, it is hard to overstate the importance of the U.S.-China relationship. How the two countries interact will have a major impact on the global economy, security situation, and environment. Adding spice and uncertainty to the meeting in Florida on Thursday and Friday is that Donald Trump and Xi Jinping are a study in opposites. The carefully contained Xi is very much a product of his political system; his entire career has been as a politician, methodically working his way up through the ranks over nearly 40 years. The flamboyant Trump is a political insurgent who has changed parties five times and delights in upsetting “the establishment” in Washington. Despite the intermediary roles played by the president’s son-in-law, Jared Kushner, by Henry Kissinger, and by the People’s Republic of China ambassador in Washington, Cui Tiankai, it is a fair bet that Xi is still unsure of the nature of the man he will be meeting. Xi himself is still in the process of defining a new, more expansive foreign policy for China and, while he has shown himself not afraid to take big decisions or set new paths, he is likely to tread cautiously. That is especially so since this is a sensitive period politically for him in the run-up to the all-important Communist Party Congress at the end of the year. It is telling that the Chinese delegation has chosen to stay at a separate hotel and not at the president’s Mar-a-Largo resort in order to put a distance between themselves and their host (and to avoid the danger of Trump roping Xi into glad-handing other guests). The two men look to have very different strategies going into the meeting: After his reverses on healthcare and the travel ban and facing a filibuster over his Supreme Court nomination, Trump is likely to be after some quick result which he can tweet and celebrate. His encounter with Angela Merkel having produced poor mood music, he will want to put a positive spin on the Mar-a-Largo meeting. Xi may offer some insignificant gestures, such as talks on restraining Chinese steel exports to the U.S. (which account for less than 1 percent of the total). But his main aim will be to get the president to agree to broad principles which may not mean much to a transactional operator but which Beijing can interpret and apply as it sees fit. At the same time, Xi will want to reassert himself as the champion of globalization and of measures against climate change to broaden China’s appeal in the face of uncertainty about the administration’s stance. I agree with all the writers above that there are a number of long-standing issues that will probably come up in discussions between Trump and Xi or their surrogates. And I also agree that it is unreasonable to expect substantial steps toward resolving anything. But I think something simpler and more profound is involved. In the two months and more since assuming office Trump has created several opportunities, on topics ranging from climate change to Syria and Yemen to global trade and economic stability, for the United States to cede leadership and credibility to other countries. In some of those instances, it has been Xi Jinping who has come forward to play the role of global adult. For the first time China has a chance of assuming a role of moral leadership in addition to its roles in trade, development and military presence, and the elements for this are all in Xi’s control. The awareness of this in China is succinctly expressed in the state media suggestion that the U.S. is just one of several stops in Xi’s world tour. Nothing special, just another place to check in. For Trump, the challenge is to present himself and his country as simply important —not hyped, not gilded not branded, just important. It has been a century or so since Americans have had to make this effort (this is looking back to Teddy Roosevelt’s days of the soft speech and big stick), and there appears no widespread instinct for how this is done, and certainly no confidence that Trump has any way of doing it (particularly at Mar-a-Lago). By all comprehensive standards, the United States is still the world’s wealthiest society and it is its unquestioned military behemoth. But it is losing ground every minute as an object of respect and admiration. At the same time Xi has proven much more at ease with an international role than any of his predecessors. He has done a good job of presenting himself in international venues as a man of confidence and courtesy, able to attract respect without bluster. One Belt/One Road initiative is still marketable as a scheme for mutual enrichment and stability in much of Asia, Africa and Europe. It doesn’t look like an even match. But it might not be as easy for Xi as all that. Trump has managed to mar the dignity of every world leader who has come within an arm’s length of him. It is one thing to sit on the other side of the world and look like a man of substance while the U.S. reels from a series of self-inflicted taser strikes. It is another to get through a shoulder-to-shoulder meeting with Trump without being insulted, embarrassed or both. Xi’s handlers will have to figure out how to keep a proper distance between their man and the American president without their old tactics of shoving and shouting. Each side has its work cut out for it. Many commentators above are right in predicting that the North Korean problem is going to loom large in the meeting. North Korea’s firing of a ballistic missile into Japan’s water on the eve of the meeting makes sure it is the case. There are plenty issues—Taiwan, the South China Sea, Trade, etc.—that could sour U.S.-China relationa, but nothing is more urgent than the North Korea issue. Kim Jong-un has been ever more aggressive and erratic lately, frequently conducting missile and nuclear tests (two underground nuclear tests last year alone) and allegedly assassinating his half-brother in broad daylight in Malaysia. Looking back to the 1990s, the international community, Asian countries in particular, were worried that the North Korean government, having plunged into desperation after its Soviet sponsor disappeared, could either go rogue or collapse. That would have triggered a war or a refugee crisis in Northeast Asia. Back then, Beijing guaranteed the U.S. and its Asian neighbors that it would keep North Korea in check, deterring it from becoming aggressive and developing its nuclear and missile technologies. Since then, Washington has seen Beijing’s help as indispensable to the maintenance of peace and stability in Northeast Asia, while the U.S. military was busy in the Balkans, the Middle East, and elsewhere. Over the last quarter century, whenever there was a debate in Washington about whether to compromise and help Beijing on trade, Taiwan, or other issues, invariably, “we need Beijing’s goodwill and help in restraining North Korea” was a key argument supporting American accommodation of China’s demands. Given the increasing security threat posed by North Korea today, many Asian countries would say that China has not delivered. North Korea’s ballistic missile and nuclear weapon development never stopped. Making things worse was the Obama administration’s revelation last year that a Chinese state company was involved in the North Korean nuclear program in defiance of international sanctions. Many see Beijing either lost control of Pyongyang or aided Pyongyang’s ambitions clandestinely. As such, the THAAD system that the U.S. recently deployed to South Korea is quite popular there. South Koreans see it as a necessary defense against North Korea’s growing threat when China is not helping much. China’s nationalist reaction to the THAAD system and the ensuing Chinese boycott of South Korean products only swayed South Korean public opinion more to the U.S. The Trump administration has been embattled by domestic troubles. A domestically unpopular government is often tempted to show some muscle overseas. Xi should take seriously Trump’s threat of the U.S. going it alone to take out North Korea’s aggressive capability. If an open conflict between the U.S. and North Korea breaks out, public opinions in Japan and South Korea are likely to be on the side of the U.S. Such scenario would be a nightmare for Beijing, as it would force a choice between defending Pyongyang against everybody else or abandoning it. The Trump-Xi meeting is a good chance, if not the last chance, for Xi to promise more concrete, realistic action to avert military conflict over North Korea. Never has there been a better moment for President Trump to live up to his twitter handle, @realDonaldTrump. The upcoming Mar-a-Lago summit with Xi Jinping offers the clearest opportunity yet for the unmasking of the real Donald Trump. In keeping with his long-standing association with professional wrestling, Trump has set up a classic internal battle to resolve this identity crisis. In one corner are the “traditionalists”—a tag-team led by Gary Cohn and Steven Mnuchin, who dominate the still nascent policy process at the National Economic Council and U.S. Treasury, respectively. In the other corner are the “disruptors”—led by Stephen Bannon and Peter Navarro, strategists without explicit policy portfolios. Both teams appear to have strong benches—senior advisor Jared Kushner for the traditionalists and Wilbur Ross (Commerce Secretary) and Robert Lighthizer (U.S. Trade Rep nominee) for the disruptors. Each side has their own distinct agenda heading into the Mar-a-Lago summit. The traditionalists are also incrementalists. Afflicted by a severe case of “trade-deficit disorder,” they are looking to a reduction of the outsize U.S.-China bilateral trade deficit as the means to make America great again; their focus is on improved U.S. access to rapidly growing domestic markets in China, especially for automobiles, agricultural products, and services (both financial and nonfinancial). The traditionalists are well aligned with Xi Jinping’s agenda, which appears framed more along the lines of the mutual respect required of the so-called “new model of major country relationship” that arose out of the Sunnylands Summit of 2013. As such, the Chinese would like nothing more than Trump Administration validation of their new global initiatives—especially the Belt and Road program, the Asian Infrastructure Bank, and WTO-based market-economy status. The disruptors argue that the days of incrementalism are over—that they have accomplished nothing more than ever-expanding trade deficits with China, the means by which a once great America has been “raped” by massive job losses, factory closings, currency manipulation, and non-compliance with WTO rules. While the facts are loose and easy in substantiating their case—especially since a technology-led erosion of U.S. manufacturing long predates the rise of modern China—the disruptors have a secret weapon: the rhetorical support of candidate Trump and his penchant for campaign-style governance. In TrumpWorld, where uncertainty is the only certainty, there are clear limits to the skillsets of those of us who purport to be experts in the U.S.-China relationship. Whether we come at the relationship from the perspective of economists, foreign policy strategists, historians, or amateur psychologists, it is virtually impossible to predict which Donald Trump will sit down with Xi Jinping over the next couple of days. Needless to say, recent developments in North Korea complicate the call. But Trump has tipped his hand here. If need be, as he stated in his recent Financial Times interview, the U.S. will “totally solve” North Korea with or without China. So now it’s show time at Mar-a-Lago, and the @realDonaldTrump is about to stand up. Don’t be surprised: Once a disruptor, always a disruptor. A brief follow up to some of the mentions of climate change in the contributions to date. As we know, relations between President Obama’s administration and Beijing were not untroubled: the pivot to Asia raised hackles in Beijing and the period was marked by open geo-strategic rivalry that frequently tipped over into public acrimony. But there was one strand of U.S.-China relations that not only produced positive results in both domestic and international policy, but also consolidated a set of relationships that were sufficiently robust and positive to ensure that active cooperation continued, even when everything else was in the freezer. That strand was, of course, climate change. President Obama and Xi Jinping ended this stalemate and turned a negative relationship into a positive, paving the way for the successful outcome in Paris in 2015. It is hard to overstate the importance of this, not only for the U.S. and China, as vulnerable to the impacts of climate change as other countries, but to the rest of the world: Europe, which has exercised leadership in the past but has recently been preoccupied with other problems; and the global south, and those many countries that have contributed almost nothing to climate change but nevertheless will suffer its consequences. In another world, climate cooperation might have been high on the agenda for this meeting: the world’s two biggest polluters might have agreed to deepen a mutually beneficial cooperation that would have earned them broad international support. As things stand, China has muted its statements on climate change recently, perhaps to avoid raising tensions further in advance of the meeting with a man who, in one of his least defensible observations, has described climate change as a “Chinese hoax.” Xi Jinping will be well aware that Mar-a-Lago is one of many U.S. coastal properties threatened by sea level rise, but will doubtless be too polite to point it out. Xi has made it clear that China will not abandon its climate commitments, but there is no doubt that the Trump administration’s obstruction and hostility to climate action places a greater burden on China, and could result in less leadership when more is needed. It also leaves this high-profile meeting without the easily achieved, positive outcome that climate cooperation offered. This is a diplomatic loss to the U.S. and China, and raises the threat for the other 195 parties to the Paris Agreement that climate action will be too little, too late. There has been much expectation built up around what should be talked about, or even resolved, when President Xi Jinping and President Donald Trump meet at Mar-a-Lago. However, the goal of their first face-to-face meeting should be to build a good personal relationship that facilitates a constructive and productive relationship between the two countries. This is especially true given that the Trump administration is less than 80 days in office, with many official positions yet to be filled and several cabinet nominees, such as U.S. Trade Representative Bob Lighthizer, yet to be confirmed. The new U.S. administration still has not rolled out a comprehensive foreign policy and trade policy, except what Trump said while on the campaign trail, or Tweeted or mentioned in casual conversations since his inauguration. The China-U.S. relationship is too immense and too consequential. A good personal rapport between top leaders would enable the two countries to expand greatly the areas of cooperation in the years ahead while effectively addressing their differences. It will prevent the two nations from drifting into a strategic rivalry or the so-called “Thucydides Trap” between a rising power and the existing power that many worried about during President Obama’s eight years in office. Despite their growing economic interdependence, there is still vast potential for win-win cooperation that is untapped. This includes the conclusion of a Bilateral Investment Treaty which will inject fresh momentum into both economies. China, given its impressive record in infrastructure construction in the past decades, can play a positive role in helping accomplish Trump’s ambitious plan to fix the crumbling infrastructure in the U.S. The U.S. should also switch to a more positive attitude towards the Asian Infrastructure Investment Bank and one belt, one road, which aim to facilitate regional connectivity and economic development, a great development for everyone. The thinking that the U.S. should not endorse any China-led initiatives reflects a zero-sum mentality that Trump should not inherit from his predecessor. There is a host of bilateral, regional, and global challenges that require China and the U.S. to work together. White House officials and many Western pundits these days have put the denuclearization of the Korean Peninsula and some trade and investment issues between China and the U.S. on top of the list for the summit. These are indeed complicated issues upon which experts in the field cannot agree. No one, for example, seems sure that the current U.S. approach to pressure China to use its economic leverage on North Korea, or a U.S. targeted strike of Pyongyang’s nuclear facility, would lead to a solution. In fact, similar simplistic approaches to the issue have failed in past years and decades. The time is now for China, the U.S., and other parties involved, to conduct more consultation, rather than take unilateral actions. The same is true on bilateral trade issues. Many U.S. economists, for example, believe that blaming U.S. trade deficits and job losses on China or Mexico is missing the big picture. Such misguided analysis would lead to wrong policies. For all these reasons that it is unrealistic to expect quick results from the first informal summit. But if the two leaders can build a good personal rapport, it should be relatively easy for the two countries to sort these things out in the days and years ahead. Professor Pamela Kyle Crossley struck the right note: the U.S. is just one of several stops on Xi’s world tour, a stark contrast when compared with the well-planned Xi-Obama summit in 2015. Xi’s impending arrival seems like a stop-over after the just-ended Finland summit. Xi and Trump may successfully draft reciprocal trade policies at their first short summit, but it would be very hard for them to reach unanimity on North Korea since China barely ever takes sides on any international sanctions. Of the five permanent members of the United Nations Security Council, China is the nation that most often abstains from voting. There’s little probability that China will take a tougher stand against its moody neighbor North Korea. If the U.S. really wants to demilitarize North Korea, Trump definitely has to act alone without waiting for China to join in or waiting to hear the Xi administration reiterate its interminable excuses. For newsrooms and on social media, the Donald Trump-Xi Jinping summit is set to be filled with interest. Even the handshake styles of the two leaders will be parsed for clues to the bilateral relationship. For the markets though, the expectation is that the meeting will deliver little in the way of concrete outcomes. Shares in Taiwan’s tech firms—first in line for a fall if trade relations collapse—are substantially up from their post-election lows. Shares in China’s biggest ports are also up, suggesting little fear of a trade war sinking cargo volumes. The yuan is stable around 6.89 to the dollar—the level it has held since the start of the year. Traders see little prospect of Trump’s tough talk on currency manipulation having any impact on China’s management of the yuan. Looking forward, there are important issues to address on trade and exchange rates. The conversation will start at Mar-a-Lago. As is often the case in diplomacy, deliverables will be slower to arrive.